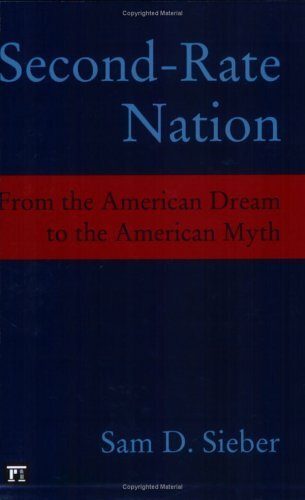 In Second-Rate Nation: From The American Dream To The American Myth Sam D. Sieber argues that the United States has replaced the cherished American Dream with an American Myth designed to conceal and ignore festering cancers at the foundation of society. These dysfunctions are surveyed and documented with incredible logical rigor, mountains of evidence and data, statistical analysis and expert testimony. The author’s intent is to make the reader aware of the reality of the national situation and the implications it has in fostering a backward, suffering society, a role which he argues the media should fulfill by providing regular ‘social reports’ but is encumbered by ulterior motives and thus fails to accomplish. Second-Rate Nation reads like a giant research paper. Every claim that is made (however remote or “common sense”) is documented with at least one critical source, resulting in a index of sources that exceeds 70 pages. The dry, unbiased, indifferent writing style and dense evaluation and analysis of hard data may intimidate some but the information contained is crucial for understanding the current condition of the United States society and where it is headed. The revealed portrait is shocking but Sieber remains stoic and level-headed in his methodical presentation throughout, never allowing his passions to explode into anger or contempt or even offering any unnecessary commentary outside of the analysis. The reader is implored to consider the facts and then contrast those facts with what is presented to the public in the constant information war waged by media, big business and government. The logical conclusion is that unless fundamental reforms are enacted at every level of government then the United States is doomed for failure or fascism. While the chapters are large and overwhelming in the amount of information presented Sieber graciously provides a succinct summary at the end of each to tie things together. I found these chapter summaries to be absolutely necessary as its hard to convey in this review just how dense the writing is: presenting fact after fact, citation after citation, analyzing overwhelming bodies of evidence that reinforce the thesis. The font is small and single spaced and the margins are slim, leaving the reader with 400 pages of pure firepower to use in debates and as a starting point for other research into the Empire’s decline. I recommend this book as the perfect primer for any sort of individual who has noticed that our nation is troubled and has some semblance of why but desires a comprehensive understanding of the situation; for the individual who grows tired of the information war waged against reality and seeks truth. In dire times such as these it is important that we discuss the topics presented in this book so that we can hopefully avert the total collapse that is hinted at within. Only passionate, courageous individuals with an appreciation for civic virtue and grave concern for the wellbeing of the community, working together, united under the selfless example of Cincinnatus and the ideals of the Republic can lance away the cancers that degrade our nation and establish a new foundation for a sane, compassionate, honest society.